Gameloft’s Asphalt series has certainly come a long way since its humble beginnings as a portable title on the Nintendo DS and early mobile devices. Indeed, since the iOS release of Asphalt 4 (the first of the series to grace Apple’s platform) each iteration has done a good job steadily improving what the series has to offer in order to stay competitive with other iOS powerhouse racing titles. This progression seems to have hit its pinnacle with Asphalt 8: Airborne (Free), the fourth iOS release in the series. With beautiful visuals, plenty of content, and a fast and furious take on iOS racing, Asphalt 8 is a excellent racer on all fronts and needs to be checked out. 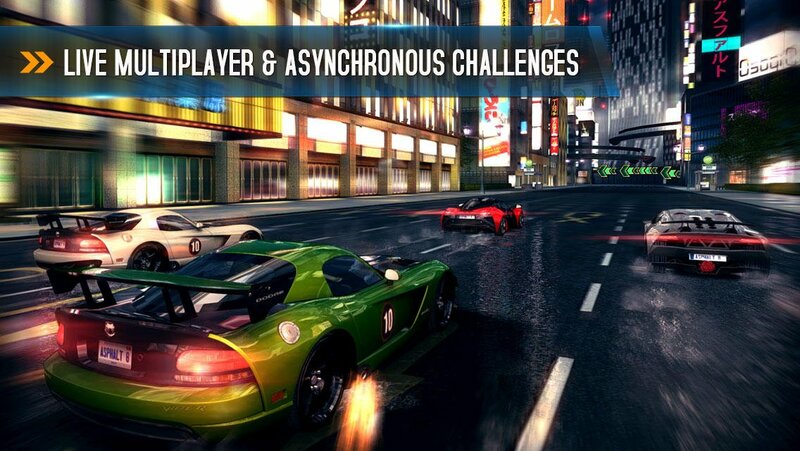 If you’ve played Asphalt 7 or any game in the Burnout series, you’ll feel at home when you fire up Asphalt 8. The game’s focus on arcade-style objective-based races works as contrast compared to more simulation-oriented titles such as Real Racing 3. Players earn awards based on a variety of objectives in-game such as narrowly missing cars, performing stunts mid-air or causing the opposition to wreck. While each of these eventually earn small amounts of currency at the conclusion of the race, most importantly they earn nitro in-game. The collection and strategic use of nitro is the key to success in Asphalt 8. It’s also the gameplay element that turns the whole game from simply fun to an awesome experience. Activating nitro instantly adds an intense layer of speed to your car, making the road and backdrop scream by with some cool effects. Nitro also allows you to temporarily take out the opposition (which earns you even more nitro) giving you an edge in racing. Now, arcade racers with objectives and nitro aren’t really particularly novel ideas in the genre, but where Asphalt 8 shines is in its implementation. A decent set of control options ensures all players can stay competitive. Meanwhile, the graphics engine does a great job of imparting that sense of speed that is essential for a game that thrives on fast gameplay. A robust career mode, online multiplayer (complete with rankings) and a killer soundtrack round out the areas the game does well. One of the areas I absolutely love in Asphalt 8 is its overall presentation. The menu system is clean but cool, and it’s very easy to just jump into races. I’m also really digging the large variety of vehicles available to check out (extra points for the inclusion of the Tesla Model S and the Mini Roadster – two of my favorites). Variety isn’t the only thing Asphalt 8 has going for it, car models look great both in-game and otherwise. I found myself just perusing the vehicle list and checking out the cars from all angles. Of course, all these cars don’t come cheap, and this is the only area where Asphalt 8 somewhat falters. The difficulty curve is pretty level through the first few series of cars and seasons, but as you get towards the really expensive cars, you’ll notice that you don’t earn quite as much money proportionally to afford what you might want. This is especially true since most seasons have special races that can only be competed with certain cars, which may force players’ hands in spending some of that hard-earned currency just to buy a car they may not want, but need to earn stars. This may lead some gamers to the game’s currency buys or car pack IAP, especially for completionists that want everything. Still, it’s important to note that no car or feature is exclusively locked away and, even with the above concerns, I never felt discouraged at the grind. It’s also a relatively minor complaint with a game that offers such a great experience actually playing the game. When you combine that with the impressive graphical sheen and the large amount of available content, I can’t really think of a reason why you shouldn’t check out Asphalt 8. The iOS platform has quietly become a haven for great racers, and Asphalt 8 looks to be leading the pack right now.